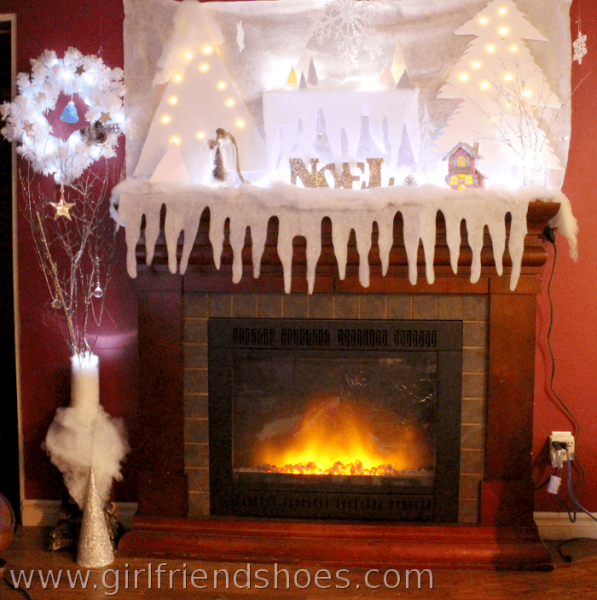 This is my empty mantle with a blanket of snow put up as a background for my Winter Wonderland mantle project. Also, the trees are cut out from dollar store foam board and have tiny fairy led lights poked into the back of the foam trees. 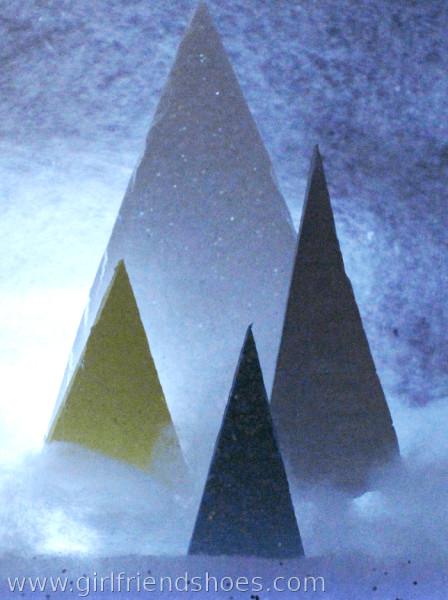 I cut out small trees from more foam board and added sparkles to some of them. I added scraps of the foam board to the back of the trees to keep them in a standing position. 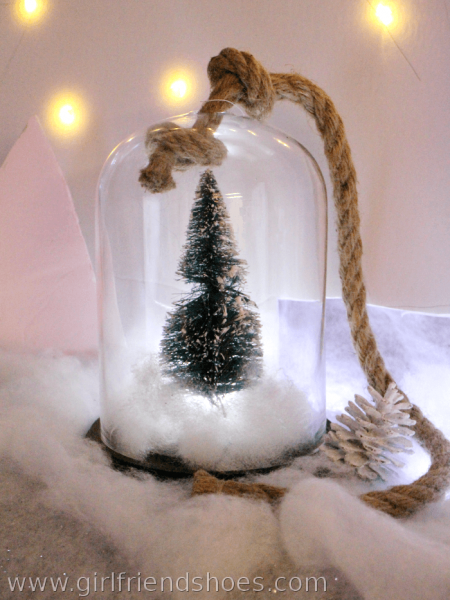 I had another tree in the place of this lovely glass jar with a cute little bottle brush tree in it originally but decided that this looked nicer. The shelf above the mantle that you see is another foam board project. I made a temporary shelf out of the foam board and tacked it into the wall. 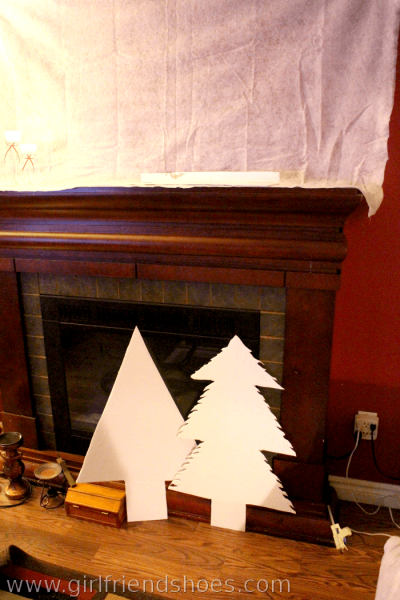 It’s not sturdy enough for anything heavy but worked great for the foam board trees and hanging snow. 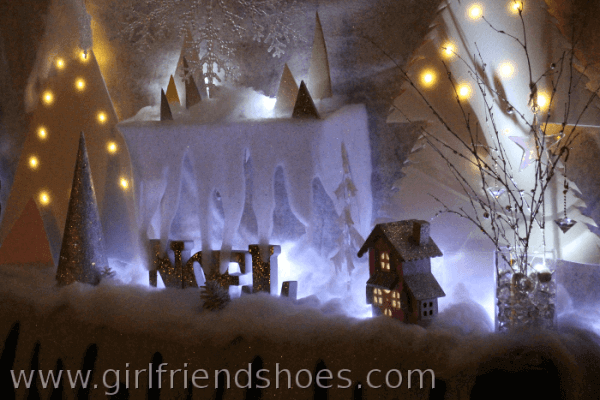 I added two vases of glittery twigs, one on each end of the mantle and hung crystal looking ornaments on them that shine beautifully in the led lights. 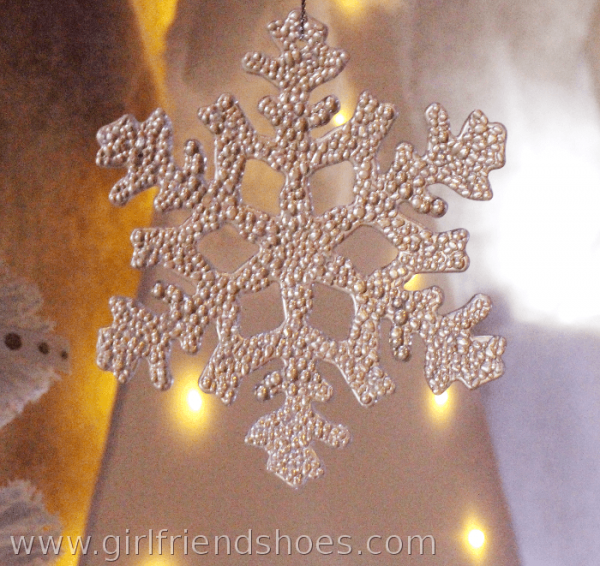 Then I hung different sizes of clear plastic snowflakes from the ceiling. They also shine beautifully in the lights. The little glitter house is my favorite because it’s sparkly and pink. I got this house at the dollar store also and painted it with acrylic craft paints and then modge podged the glitter on. 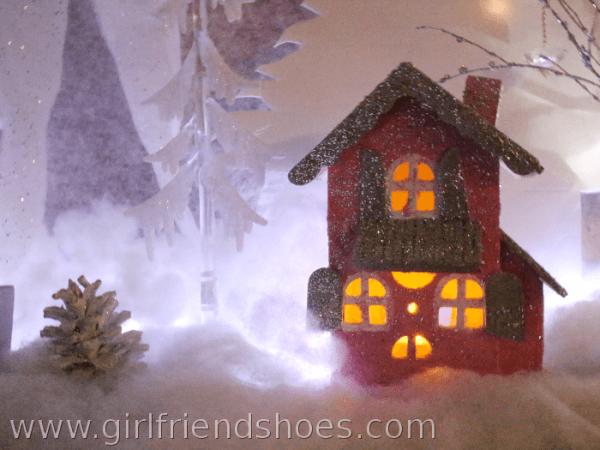 I used a warmer colored flameless candle inside the glitter house. I figured it was more life like. I would totally have a sparkly pink house in real life if I could. Here’s a lighter view of the entire mantle scene. 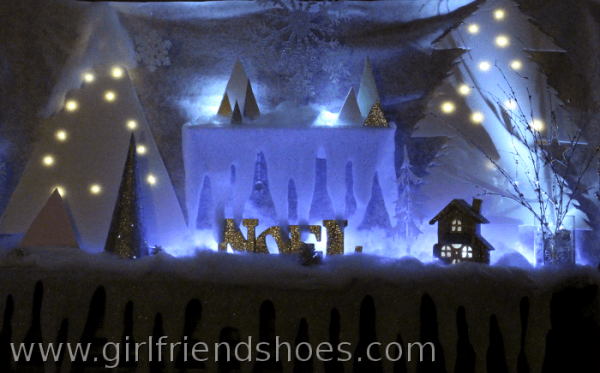 I even added my winter wonderland wreath to the scene. And another darker view with all the led and fairy lights on. The pictures give a fairly good view however, they really don’t do it justice. 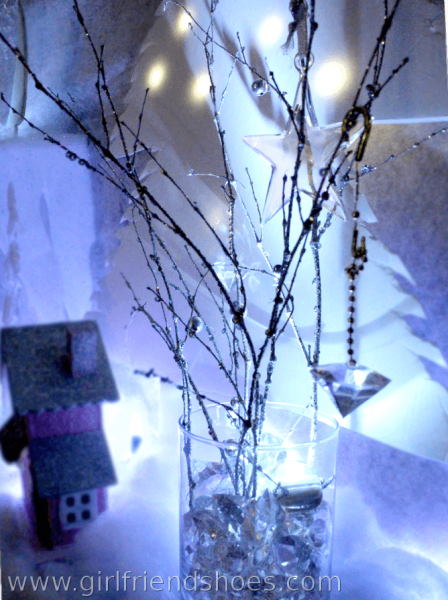 The sparkle and shine off the branches n’ things look so much better in real life. 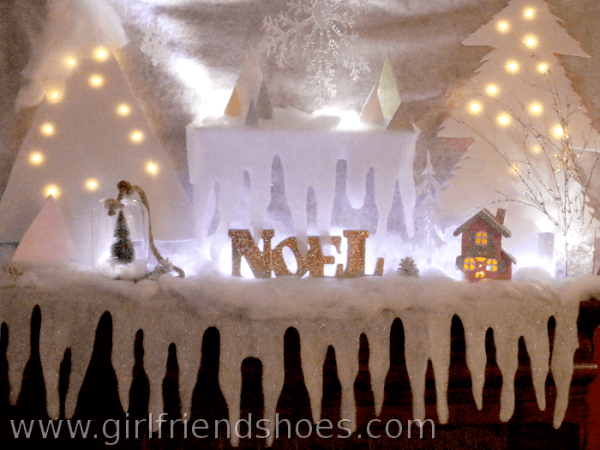 Last year I decorated the mantle with primitive decorations; flame less candles & LED lights with barn stars. 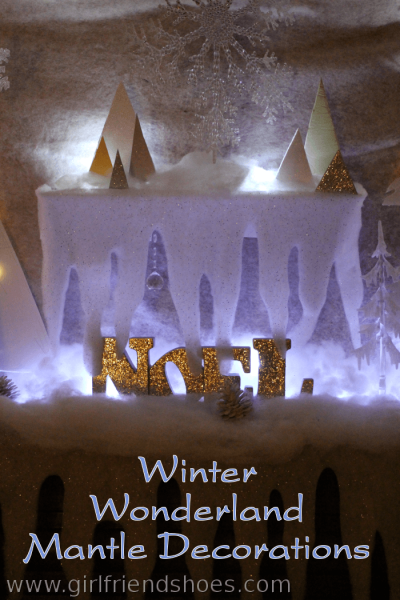 What do you think of my Winter Wonderland mantle decorations?